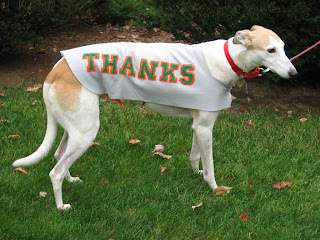 Our friend Snap the Greyhound had been wearing her Vote Yes on 3 coat on her daily walk, but today she was sporting a new coat! That's because Massachusetts voters have overwhelmingly passed Question 3, the Greyhound Protect Act, by a margin of 56% to 44%!!! This is the first time in history that dog tracks have been closed down by citizens vote. This is a fantastic win for dogs in Massachusetts and it marks the demise of an industry that exploits dogs for entertainment and profit. Moving forward, GREY2K USA will work to place any and all available greyhounds from Wonderland and Raynham Parks. Stay tuned to learn how you can support this effort as the tracks begin winding down their operations.